This intelligent mollusc has almost incredible powers of mimicry. It can control the colour, patterning and texture of its skin to perfectly match its surroundings. And not just from above, the camouflage works from whichever angle it is observed. From birth, cuttlefish can display at least 13 type of body pattern, made up from over 30 different components. 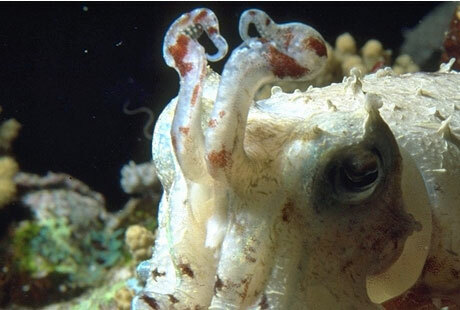 A recent study suggested that the military can learn from the cuttlefish and create "invisible suits". 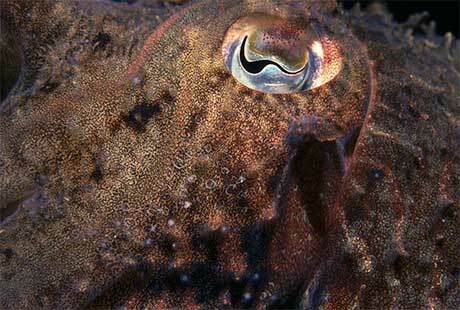 In addition to avoiding predators, pattern control is also used in courtship by male cuttlefish. This impresses females and warns off competitors. After mating the male will often defend the female while she lays clumps of eggs. These hatch in two to three months to reveal minature cuttlefish. Females only breed once and die soon after laying. With its flattened body skirted each side with fins, the cuttlefish moves with a pretty rippling motion. Like the closely related octopus, it can also escape by powerful jet propulsion whilst simultaneously ejecting a cloud of black ink to distract its foe. This ink is called sepia and was once used by artists. The cuttlefish's beak-like mouth is surrounded by eight arms each with two rows of suckers. It also has two long extendable tentacles with suckered, club-like ends for catching fast-moving prey like crustaceans and fish. To change colour, the cuttlefish has a central sac (chromatophore) containing granules of pigment. This is surrounded by a series of muscles. When the brain sends a signal to the cell, the contracting muscles make the central sacs expand, dispersing pigment and generating the optical effect. Their skin can change colour and pattern in just a second to match their environment. Scientists have recently also discovered that cuttlefish possess luminescent protein structures that allow them to actively emit light, not just reflect and filter the ambient light from their environment. Additionally, they also discovered the presence of reflectin in the chromatophores, a high-refractive-index protein that, they suggest, allows the chromatophores, when highly stretched out, to more effectively absorb light than if they contained color pigments alone. 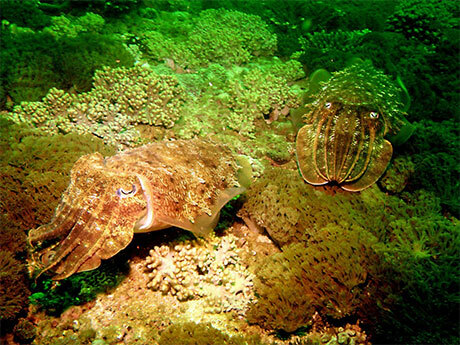 According to Helmut Debelius, the hooded cuttlefish can grow to 30 cm but is usually only half that size.You find these cuttlefish in the Red Sea, Arabian Sea and Indian Ocean. Porites is a common coral especially successful in shallow reef areas. Branched colonies often form large tracts along the reef front in both the Atlantic and the Indo-Pacific. Porites porites looks like a thicket of stumpy fingers, hence its commo n name. Porites capture food with their tentacles which may be extended during the daylight or during the night. These are armed with batteries of stinging cells called nematocysts which both poison and capture. Their most important food is zooplankton. Although usually brownish in colour, occasionally Porites porites is a lovely bright blue. You find it on most reef environments from 0.5 to 35 m depth but most commonly from 1-15 m.
Porites is more prone to disease than many other corals. According to the IUCN, coral disease has emerged as a serious threat to coral reefs worldwide and is a major cause of reef deterioration. The numbers of diseases and coral species affected, as well as the distribution of diseases have all increased dramatically within the last decade. Like all corals, Porites is listed on CITES Appendix II. This lists species that are not necessarily now threatened with extinction but that may become so unless trade is closely controlled. Stromatolites, as their structures are called, were laid down in shallow seas. Some are tiny; some as big as a house. The finest fossil examples are in Western Australia. A bed there is dated 3430 million years ago! To put that in context, dinosaurs died out just 65 million years ago. The ancient stromatolite builders were responsible for the release of oxygen into the earth's atmosphere. They combined the sea's calcium salts with carbon dioxide, liberating oxygen. Because of their actions oxygen concentration has risen from 1% to the 21% of recent times. The stomatolite dominion lasted for more than half the history of life. They have all but faded away now, but some still hang on: building in Shark Bay in Australia and in the Bahamas. Stromatolites were much more abundant on the planet in Precambrian times. While older, Archean fossil remains are presumed to be colonies of cyanobacteria, younger (that is, Proterozoic) fossils may be primordial forms of the eukaryote chlorophytes (that is, green algae). One genus of stromatolite very common in the geologic record is Collenia. The earliest stromatolite of confirmed microbial origin dates to 2.724 billion years ago. A recent discovery provides strong evidence of microbial stromatolites extending as far back as 3.450 billion years ago. Stromatolites are a major constituent of the fossil record for about the first 3.5 billion years of life on earth, peaking about 1.25 billion years ago. They subsequently declined in abundance and diversity, which by the start of the Cambrian had fallen to 20% of their peak. The most widely-supported explanation is that stromatolite builders fell victims to grazing creatures (the Cambrian substrate revolution), implying that sufficiently complex organisms were common over 1 billion years ago. Modern stromatolites are mostly found in hypersaline lakes and marine lagoons where extreme conditions due to high saline levels exclude animal grazing. One such location is Hamelin Pool Marine Nature Reserve, Shark Bay in Western Australia where excellent specimens are observed today, and another is Lagoa Salgada, state of Rio Grande do Norte, Brazil, where modern stromatolites can be observed as bioherm (domal type) and beds. Inland stromatolites can also be found in saline waters in Cuatro Ciénegas, a unique ecosystem in the Mexican desert, and in Lake Alchichica, a maar lake in Mexico's Oriental Basin. Modern stromatolites are only known to prosper in an open marine environment in the Exuma Cays in the Bahamas. Laguna Bacalar in Mexico's southern Yucatán Peninsula in the state of Quintana Roo, has an extensive formation of living giant microbialites (that is, stromatolites or thrombolites). The microbialite bed is over 10 km (6.2 mi) long with a vertical rise of several meters in some areas. These may be the largest sized living freshwater microbialites, or any organism, on Earth. Freshwater stromatolites are found in Lake Salda in southern Turkey. The waters are rich in magnesium and the stromatolite structures are made of hydromagnesite. A little further to the south, a 1.5km stretch of reef-forming stromatolites (primarily of the Scytonema genus) occurs in Chetumal Bay in Belize, just south of the mouth of the Rio Hondo and the Mexican border. Another pair of instances of freshwater stromatolites are at Pavilion and Kelly Lakes in British Columbia, Canada. Pavilion Lake has the largest known freshwater stromatolites and has been researched by NASA as part of xenobiology research. NASA, the Canadian Space Agency and numerous universities from around the world are collaborating on a project centered around studying microbialite life in the lakes. Called the "Pavilion Lake Research Project" (PLRP) its aim is to study what conditions on the lakes' bottoms are most likely to harbor life and develop a better hypothesis on how environmental factors effect microbiolite life. The end goal of the project is to better understand what condition would be more likely to harbor life on other planets. There is a citizen science project online called "MAPPER" where anyone can help sort through thousands of photos of the lake bottoms and tag microbiolites, algae and other lake bed features. (242 lbs or over 17 stone ). It is a grouper, exceedingly territorial and very aggressive towards intruders. A diver has drowned after being knocked in the chest by one of these fish. Groupers are amongst the most tasty of fishes and fetch a high price, but potato cod numbers, so far, are not at risk. These fish take 5 to 10 years to become mature. Potato cods eat small rays, crabs, fish, squid, octopuses and western rock lobsters. They like to ambush their prey by hiding behind lumps of coral until their food swims past. They then lunge quickly to grab their meal. The potato cod's head and mouth are so large that it can pull in its prey in one huge gulp! According to legend, a grouper fell in love with a pretty girl but swallowed her by mistake. She had with her shells which she used to cut slits in the grouper and make her escape. The grouper was unhurt and became the first fish to have gills. As well as gills the Epinephelini group of groupers have big mouths and small teeth. They are top-level predators, mainly found close to coasts. Froese, R. and D. Pauly. Editors. 2011. FishBase. Fennessy, S., Pollard, D. & Myers, R. 2008. Epinephelus tukula. In: IUCN 2011. IUCN Red List of Threatened Species. Version 2011.2. The blue-ringed octopus - Hapalochlaena lunulata - is said to carry enough venom to kill 26 people. This small animal spends much of its time in hiding, camouflaged. But when disturbed, the octopus flashes around 60 beautifully iridescent blue rings and, when strongly harassed, bites and delivers a neurotoxin in its saliva. Don't pick one up! The flashes are extreme ly fast: much faster than generally seen with octopus. According to a study published in November's Journal of Experimental Biology, the octopus achieves the fast flashes using muscles under direct neural control. "A fast, conspicuous display...is an advantage to predators, who are warned before attacking a venomous creature, and of course to the octopus itself, as it avoids being eaten." says zoologist Lydia Mathger and lead author of the study. Blue-ringed octopus live in tide pools and coral reefs in the Pacific and Indian Oceans, from Japan to Australia. There are around 10 different species, all very small. While resting, this blue-ringed octopus is a pale brown to yellow color depending on its surroundings. Two types of poison secreted by two separate poison glands are used against prey and predators. One of the poisons is used for hunting crab, the other, the extremely toxic one, is used as self defence against predators. The octopus's parrot-like beak easily penetrates a websuit. Their venomous saliva can have dramatic effects within 15 minutes. For the first few minutes, though, if you are bitten you may feel no discomfort. Any close contact with this octopus should be treated as life-threatening immediately, as there is no antidote. How does the blue-ringed octopus (Hapalochlaena lunulata) flash its blue rings? doi: 10.1242/?jeb.076869 November 1, 2012 J Exp Biol 215, 3752-3757. BLUE-RINGED OCTOPUS FLEXES MUSCLES TO FLASH FAST WARNING SIGNALS J. Exp. Biol. 2012 215:i-ii.